A mere eleven days ago, fans of the National Football League were treated to yet another stellar Super Bowl in a decade abundant with them. From the four contests featuring the New England Patriots, all decided by less than a touchdown, to last year's last-minute heroics sending the Pittsburgh Steelers over the Arizona Cardinals and seasoned man of faith Kurt Warner, most of these games have been a testament to athletic struggle to last the ages. The game two weekends ago differed slightly, however, as the combatants represented not only the best of their respective football conferences but also two different modalities of thought and action, and in this offered two lessons in leadership. On one side of the field stood the Indianapolis Colts' quarterback Peyton Manning, the ultimate football technocrat, a man of judicious study and a wealth of knowledge. Before the game, sports pundits expected to crown Manning the Greatest Ever, casting him as the heir presumptive to luminaries like Joe Montana and Tom Brady. Yet like all heirs presumptive, Manning had to reckon with the unpredictability of the future, with options that could not be ratiocinated—and, yes, audibled—away. For Manning, Sun Life Stadium's field might as well have been Bosworth, the pretender king uncrowned as his armies failed him, the unmounted workhorse throwing his arms beseeching assistance. On the other side of the field stood the New Orleans Saints' quarterback Drew Brees, a journeyman who defied prognostication with a tenacity that surprised even his detractors. After placeholding on the San Diego Chargers—warming a seat for another heir presumptive, Philip Rivers, another man whose pretensions toward a crown have been unfulfilled entirely by himself—he was cut, his former organization citing worries about the strength of his arm. The Miami Dolphins, the same team that occupies the Sun Belt Stadium field that would showcase Brees' assumption to the head of the football kingdom, passed on Brees for the same reasons. Instead, he found himself leading the lamentable New Orleans Saints, perennial losers, preyed upon, exploited and laughed at; then he led them to the promised land, knocking supposedly overpowering and superior enemies down before him. Despite both teams trading the lead and providing excitement at unexpected possibility, two fatal acts sealed Manning's fate. 1. Against all expectations, the Saints special teams called an onside kick to begin the second half. Had it failed, observers would have condemned the act as lunacy, but its elements of surprise and risk of fatal sacrifice caught the Colts' conventional watchdogs unawares. Result?—seven points for the Saints. 2. Looking left, Manning threw a quick pass to wide receiver Reggie Wayne on a familiar and profitable hook route the team had run all season. However, the cunning Saints cornerback Tracy Porter jumped the route, intercepting Manning's throw and returning it for a touchdown. In that moment, the game effectively ended. 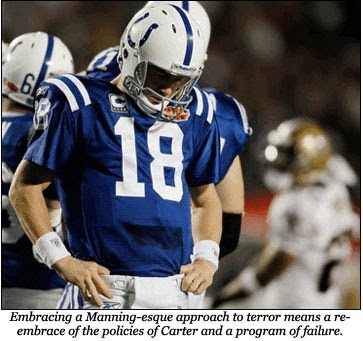 Having seized the initiative and ultimately turning the tide of the battle so fully that the Colts could only react after it was too late, the Saints watched Manning flail away at the end zone fruitlessly. In the end, what every serious fan of football and every serious observer of leadership skills saw were two men irretrievably on either side of a divide more profound than a football field. In 2005, Hurricane Katrina not only nearly destroyed the city of New Orleans but also certainly destroyed George W. Bush's reputation because of his failure to respond quickly enough to the crisis. Ironic, then, that it was a man of almost Bushian determination and focus who led the city to its greatest national triumph. Brees divided his opponents and conquered, keeping the ultimate end-zone goal in mind while taking what he was given by his enemies and exploiting their overreach for his own ends. Standing opposite him, across the divide, was a man who most exemplifies what could be called the Obama School of Thought in football. Manning's goals are always high in the air and downfield: lofty, high-risk attempts that can be vanquished by the wave of a hand or a single person out of position. Manning's technocratic approach is the stuff of exquisite intellectualism instantly voided by ugly reality. Worse, he reacts at the line of scrimmage, barking orders to underlings in fear of what someone else will do to him. When his plan fails, he either tries it anyway or concedes everything, sending feints this way and that. His momentum runs backwards, his will opposed by even the suggestion of another's. The worst thing we can do is shut that baby down... There's a big misconception as to how we are treating those prisoners; those detainees over there. They are being treated probably 10 times better than any prisoner in a U.S. prison.... They're allowed to call and write letters home, and receive letters and calls. They get five opportunities a day to pray, and they have arrows in the prison pointing towards where Mecca is. And the prison goes dead silent so these guys can have their religious time. They have rooms where they can watch movies and play Nintendo Wii.... They'll be throwing the feces and urine in the faces of the guards as they walk by and the guards are not allowed to do anything. They're not allowed to physically retaliate or do anything hardly to try to restrain these guys at all. These guys get away with whatever they want. Here, perhaps the finest representative of American resolve comes from a football field. 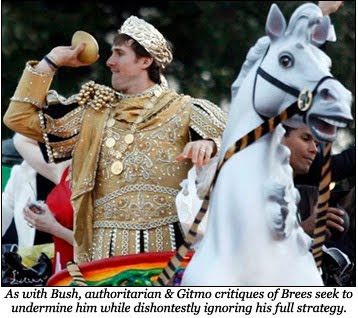 Brees recognizes not only the duplicity and hostility of the Arab threat, but the humane and above all necessary tactics and treatment we must employ to forestall and defeat it. However, to understand the vitality and strength of Brees' thoughts in action, we need not look merely to his conduct at the Super Bowl. We can extrapolate the lessons learned from his commentary and field generalship and apply them to extant threats we can already apprehend: the lurking and ineradicable compulsion of radical islamists within Israel to destroy the Jewish state and put its people to the sword. In doing so, we can appreciate both his ingenuity but also the Bushian resolution he embodies as regards this dire issue. In a Breesian conception, our tactics must be twofold. One, we must arrest and detain members of Hamas and Hezbollah as soon as the State of Israel has a reasonable expectation that their presence constitutes a threat. Israel's treatment of these individuals, like the United States', is beyond question legitimate. Most importantly, removing them from the field of battle both provides for our defense while opening our offense, eradicating the possibility of a blitz striking at our team. Our goal must then be to move determinedly forward toward our goal, to seize the territory vacated by our opponents, each down marker demarcating our steps toward progress, until victory is secured. Just as players shake hands at the game's conclusion, we can then offer our hands in friendship once triumph over opportunistic attack is secured. What must not be lost in apprehending these goals is that we too must co-opt the tactics of those who would seek to destroy us. Brees and the Saints seized momentum and the initiative by an onside kick, an asymmetrical strike not dissimilar to those of a homicide bomber. The risk to at least part of the team is total—they cannot engage in the fight—but the success chanced can overwhelm and turn the tide. When coupled with surgical brilliance in other approaches, the resulting onslaught is devastating. What Brees and the Saints did offers us no less than the right model for the future. As for other models, one need not look to Peyton Manning and the Colts. A glance at the newspaper will show you a Manning-esque ideation of foreign policy already put to the test. President Obama's diplomacy and military application differs not at all from Manning's field generalship. Just as Manning hopes to look off the safety to secure the long bomb, so too does Obama look off America's safety in the vain hopes that he can dupe Ahmadinejad away from Israel and secure a miraculous touchdown in a peaceful territory. Manning and Obama's technocratic approach are indivisible. Both conceive of the future as a chess match that can be studied and anticipated down to the last move. Both Manning and Obama conduct their business in unreality. Manning sits in a screening room, poring over tape of his opponents in the misguided belief that he can anticipate them all. Meanwhile, our current president occupies a situation room, trying to glean the situation of the future, trusting in books and figures instead of casualties and flesh. His bloodless day-tripping through a mideast peace process is literally and diplomatically exploded by the next Israeli corpse scattered by a Qassam. He fails to appreciate that the chess he plays involves pieces that explode and that his opponent culturally feels no remorse in detonating his own players, as their humanity is secondary to their religiosity and military fungibility. The Super Bowl taught much more than those looking for commercials or highlight reels were willing to see. They taught us about our futures and what we must do to preserve them. Foremost, we must secure the existence of the Jewish people and a future for Jewish children. To do that, we must embrace Breesian tactics that humanely inhibit our opponents, ensure our safety from attack, embrace the dynamic asymmetry of the opponent and more forward with fixedness and determination. To embrace a Manning strategy means embracing Obama's. We can keep in mind a lofty goal predicated on luck and the assurance of many tiny variables, but to do that is suicide. Just as we begin to move downfield, we will find our prescriptions come up empty as the savage intrusion of a thieving and perhaps murderous variable steals our best pitch and takes it—and us—irretrievably backward, to a profit for them that may ensure our irrevocable defeat. We have received complaints that Mr. Peretz's closing comments ("Just as we begin to move downfield, we will find our prescriptions come up empty as the savage intrusion of a thieving and perhaps murderous variable steals our best pitch and takes it—and us—irretrievably backward, to a profit for them that may ensure our irrevocable defeat") smack of racism. Readers note that Saints cornerback Tracy Porter, who returned Peyton Manning's throw for a touchdown, is an African-American. Thus, language that describes his pick-six as the work of a "savage" who was "thieving" and "perhaps murderous" and going "irretrievably backward... to profit" would make it sound as if Mr. Peretz were referring to racist depictions of post-Katrina looting, demonizing blacks as burglarizing, backward, murderous and animalistic. Mr. Peretz assures us that he had no intention of using these words to describe African-Americans. He meant them to refer to Palestinians. — ed.